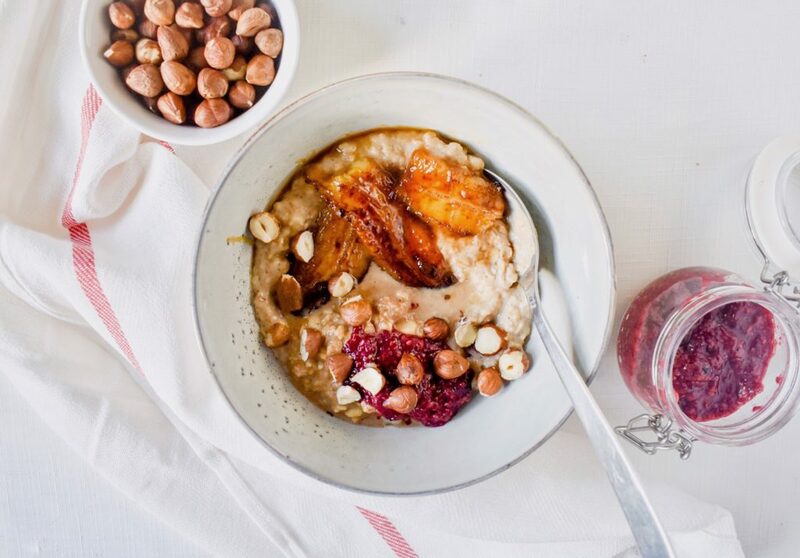 Cold November mornings call for comforting breakfasts, and what’s more comforting than a large bowl of oatmeal? 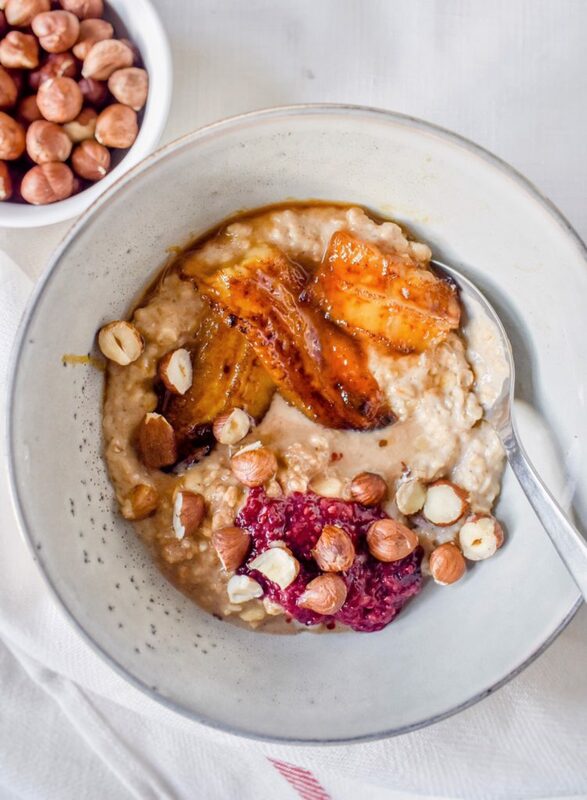 This Caramelised Banana Oatmeal is flavoured with cinnamon and topped with a myriad of tasty toppings. Trust me, this breakfast is definitely worth waking up early for. And by early, I mean just 15 minutes earlier, as that is all the time it takes! 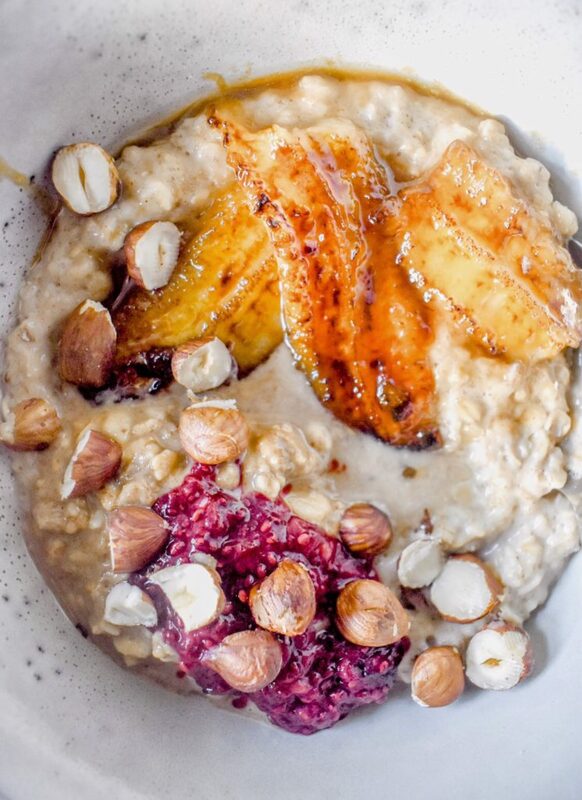 Oats are whole grains, which means they contain all three parts of a grain: the endosperm, germ, and bran. Refined grains, on the other hand, only contain the endosperm. The bran and germ are nutritionally dense, and therefore better to consume. The germ is high in protein and is a source of various essential fatty acids. The bran is rich in iron, fiber and B vitamins. This highlights the contrast between having two slices of white toast in the morning versus having a serving of oatmeal. These Oat Pancakes are both vegan and gluten free. This homemade Stove top Granola is ridiculously easy to make. Oats are the star of the base layer in this Vegan Coconut Slice. 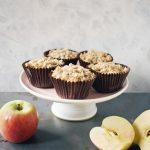 These Apple Crumble Muffins wouldn’t be the same without their sweet oaty topping. Oatmeal Raisin Energy Balls make the perfect pick-me-up. 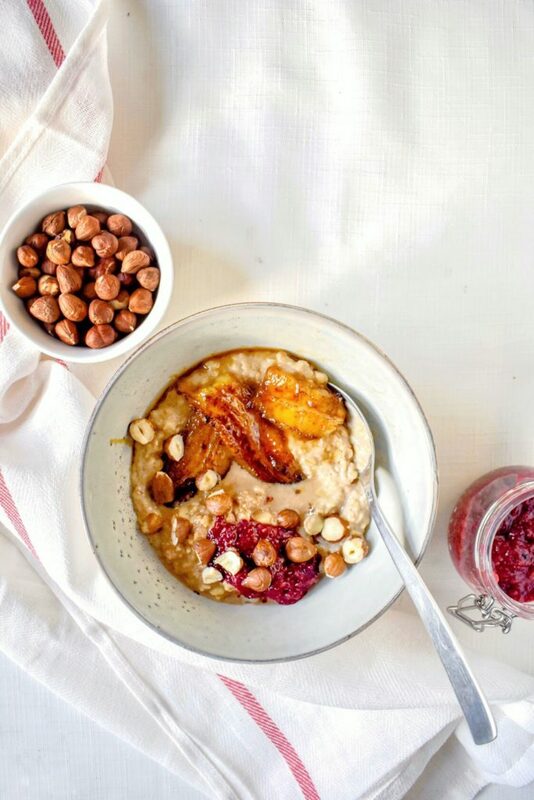 My base oatmeal recipe is simple: oats, non-dairy milk, cinnamon, and brown sugar. I find adding a pinch of salt also brings out the flavour of the oats. In terms of the milk: oats ratio, I like to keep mine pretty high to ensure the oats are extra creamy and thick. And whatever you do, do NOT cook your oatmeal in water, as that is basically a sin (unless you are into bland food for some odd reason). The combination pictured in this post! Caramelised bananas, homemade chia jam, hazelnuts, and a generous dollop of creamy peanut butter. 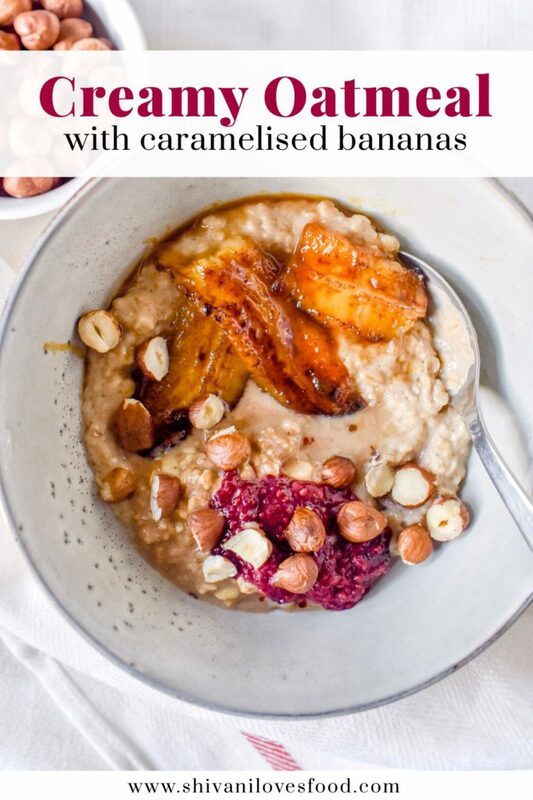 See the full recipe below for details of how to caramelise your ‘nanas to perfection. Chocoholics edition: mix in a few teaspoons of cacao powder to your oatmeal whilst cooking, then top with cacao nibs, nut butter of choice, and a drizzle of melted dark chocolate. I have yet to try this combo but you can never go wrong with chocolate and nut butter. Confession time: I used to dislike oatmeal. Once upon a time, I thought this popular breakfast dish was boring and tasteless. However, after perfecting my recipe, now have enjoy a bowl of the good stuff on the regular. 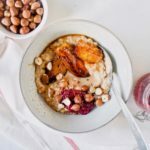 I do hope that after trying this caramelised banana oatmeal recipe, you will love it as much as I do! Add the oats, 120 ml of the almond milk, sugar, cinnamon, and salt into a pot and stir well. Cook on low heat for about 7 minutes, stirring frequently. Add the remaining 30 ml of almond milk halfway through cooking. Meanwhile, melt the coconut oil in a frying pan over medium heat. Add the brown sugar and stir well to combine. Slice a banana in half lengthwise. Spread out the caramel over the surface of the pan, add the sliced banana and cook for 3-4 minutes until golden brown. If you wish, you can flip the banana to caramelise both sides. Using homemade Almond Milk makes this recipe extra creamy. 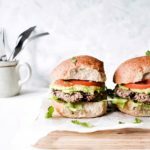 Find a very easy recipe here. I like to top my oatmeal with this Berry Chia Jam for added antioxidants. What to do with the remaining 1/2 a banana? Freeze it for use later in this smoothie recipe.